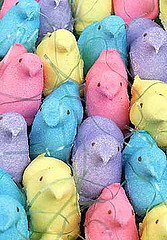 Spring is in the air and Peeps are everywhere! As usual, several of us here at Frecklebox are running slightly behind getting everything ready for our kids’ Easter celebrations. So, we’ve put together a short list of links that we’ve found to be helpful! Kaboose lists several different ideas to decorate eggs, and you don’t have to be Martha Stewart for them to turn out fabulously. Barnes & Noble has compiled a great list of Easter books (from stories about the Easter Bunny to the traditional religious meaning of the holiday) and if you don’t want to pay for overnight delivery, just stop by your local store for the same great selection. Here are some ideas on how to create Easter baskets for every kid in your home — from sporty to arty, and using very little candy. What would Easter be without a few games? Here are a few options besides an egg toss. If you really want to make this Easter one to remember, you can always coerce a family member or friend into a fantastic Easter Bunny costume! Please comment if you have any last-minute Easter ideas to share! Previous: Previous post: This Friday, April 22, is EARTH DAY! Next: Next post: Get Kids to Listen Without Nagging, Reminding or Yelling!